All pre-paid show Ticket Holders are automatically entered for a chance to win a Door Prize. Winners will be selected at random. Must enter by noon on Friday, February 22, 2019 to qualify for a chance to win. Look for your name in the show program materials, and collect your prize directly from the Wedding Professional at their booth at Rosecliff or OceanCliff on Sunday, March 3, 2019. Total combined value of the Grand and Door Prizes now exceeds $20,000! Bed Bath and Beyond: A brand new soda stream machine! Blackstone Caterers: A bottle of Veuve Clicquot Brut Rose! Bridal and Gift: A FREE veil with the purchase of a bridal gown! Dave and Kerri Photography: Mini professional engagement photo shoot session! Ellie's Bakery: 5 course tasting paired with wine for two! Exceptional Wedding DJ: Free uplighting service! Hilltop Inn: An overnight stay at the Inn! Hotel Viking: Overnight stay for two! Newport Craft & Distillery: Tasting and tour of distillery for 10 people! Salon Moshiek: A gift card to the salon! Saltwater: A custom Corn Hole set! The Cocktail Guru: Cocktail Guru Bar kit, signed copy "Mr. Boston's Bartenders' Guide" and 50% off Bachelorette or Bridal Shower Mixology Class. 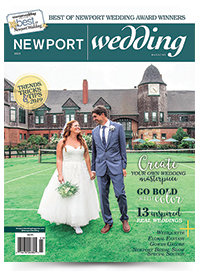 Vacation Newport: TWO night stay at any Vacation Newport property! The Vanderbilt : One night stay with breakfast included! Viking Tours of Newport: Scenic tour of Newport for TWO, covering over 150 points of interest in 90 minutes! Wingate's Cake Design: Congratulatory basket of Artisan French Macaron's, a complimentary wedding cake tasting, and $150 OFF a wedding cake for 100+ guests.